The solution with bottom-up movement is designed to be placed on benches, as in the case, for example, of hatches. 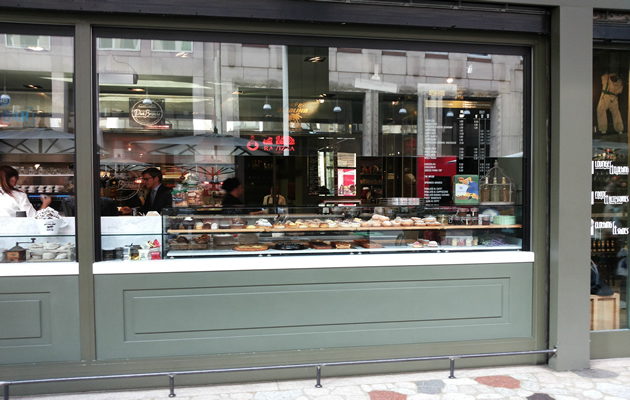 Ideal for public places such as ice cream parlours, pizza houses, bakers or delicatessen shops that wish to sell their products at the side of the street. 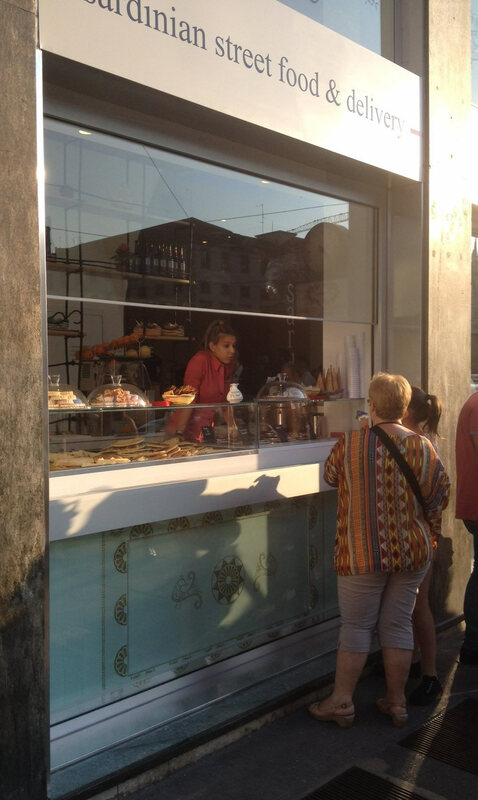 A very transparent glass window is in contact with passers-by, allowing them to look at the products and buy them conveniently. The opening and closing is implemented by an automated system in just a few seconds by means of a remote control or wall button (supervised movement). Thanks to motors with electronics, it is possible to manage groups of glass windows at the same time. This is an ideal system when there are very large sizes to protect, in fact it enables spaces up to 3000 mm wide to be covered. It can be used as a shop window (for example, for direct sales to passers-by). Normally used on existing low walls. If it is necessary to close full height spaces, normally the top-down movement version is used. Develop further. Thanks to its construction features and seals, it provides excellent sealing performance against bad weather. BellaVista Plus, bottom - up movement. 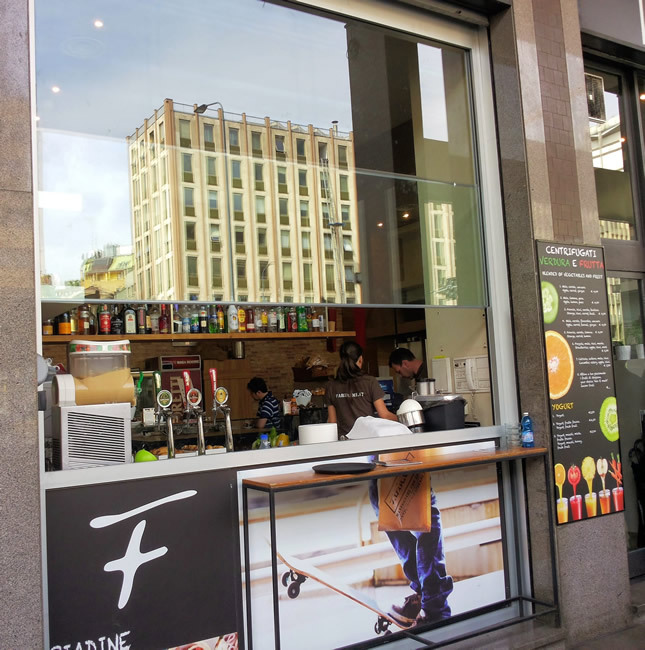 BellaVista Plus enhances shops and outdoor areas of restaurants and bars, thanks to the very transparent and elegant panels that provide shelter and at the same time allow you to admire the view even when the weather would otherwise prevent you from doing so. BellaVista plus screen is custom designed and built with tested materials to ensure both high quality and functionality. The structure is made from the primary aluminium alloy and anodized (20µm) or painted in polyester powder. The bolts and screws are made from INOX stainless steel. The materials are suitable for use in coastal areas. There are no limits in the horizontal direction, the screens can be used to surround spaces of all types and sizes, since the system is modular and completely flexible. The fixed part is in transparent or opaque glass up to 24 mm thick, or with a blank panel. Electrical movement with remote control. The possibility of bringing several modules closer together. The finishings can be personalized: the upper box can also be finished differently from the rest. No parts need lubrication or scheduled maintenance work. Fixed fanlight: a useful solution for windows higher than 2500 mm. The use of a fixed fanlight enables the beginning of the openable height to be maintained within 1,100 mm, so is excellent for contact with customers. Fixed lower part: ideal when, for example, a sales counter is below. An aluminium beam: giving strength, it allows glass of less thickness to be used, thus also reducing the overall weight of the screen. Mixed solutions: it is possible to unite the variants described above, creating an ad hoc window for your shop. The fixed parts can also be made with blank panels. 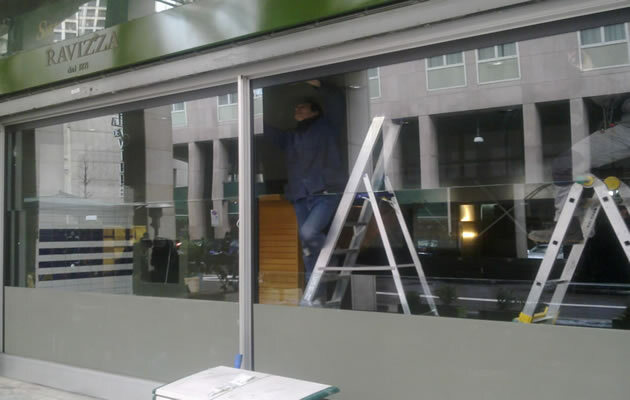 We have designed the screen so that it provides protection against the weather. 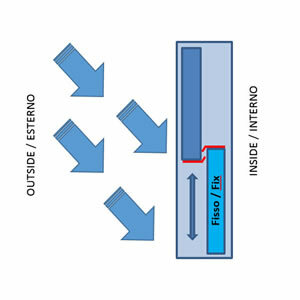 The position of the glass and the transparent seals (in red in the drawing) have been designed to reduce draughts and infiltration to the minimum. The electrical movement is operated by a special remote control or wall button. The panels can be moved individually or in groups. The power provided is 220V. Movement must be carried out under supervision. Electric movement (220V) with remote control or wall button. Hatch for bars and restaurants. Glass closed. Look carefully at the details that ensure the quality of the BellaVista Plus Vertical Sliding System. BellaVista Plus, bottom - up movement . Installation procedures.